"Across the sea of space lie the new raw materials of the imagination... Strangeness, wonder, mystery, adventure, magic — these things, which not long ago seemed lost forever, will return soon to the world..."
"I have . . . a terrible need . . . shall I say the word? . . . of religion. Then I go out at night and paint the stars." "What a sad spectacle. If they be inhabited, what a scope for misery and folly. If they be not inhabited, what a waste of space." "Space and Time! now I see it is true, what I guess'd at. . ."
"To see the world in a grain of sand and heaven in a wild flower, hold infinity in the palm of your hand and eternity in an hour." "We are drawn to where we come from." "Out yonder there is a huge world . . . a great, eternal riddle . . ."
"I do not know what I may appear to the world. But to myself, I seem to have been only like a boy playing on the seashore, diverting myself in now and then finding a smoother pebble or a prettier shell than ordinary, whilst the great ocean of truth lay all undiscovered before me." "We had the sky up there, all speckled with stars, and we used to lay on our backs and look at them, and discuss about whether they was made or only just happened . . ."
"In the universe, the difficult things are done as if they were easy." — Lao Tsu, 7th century B.C. "I know that I am mortal and the creature of a day; but when I search out the massed wheeling circles of the stars, my feet no longer touch the earth, but, side by side with Zeus himself, I take my fill of ambrosia, the food of the gods." " . . .suddenly there arose in me two things, fear and desire — fear because of the menacing dark . . . and desire to see whether there were any miraculous thing within." "I saw some of the beautiful things that heaven bears, through a round opening; and thence we came forth to see again the stars." "I am waiting for the rebirth of wonder." "Speeding through the Universe; thinking is the best way to travel." "A child's world is fresh and new and beautiful, full of wonder and excitement. It is our misfortune that for most of us that clear-eyed vision, that true instinct for what is beautiful and awe-inspiring, is dimmed and lost before we reach adulthood." "Looking up at the stars always makes me dream, as simply as I dream over black dots representing towns and villages on a map. Why, I ask myself, shouldn't the shining dots of the sky be as accessible as the black dots on the map of France?" "He has ventured far beyond the flaming ramparts of the world, and in mind and spirit traversed the boundless universe." "I've been prepared for the reality of space travel ever since I was eight years old, sitting in the planetarium." "You love the planetarium. To be without the planetarium causes you horrible pain. All you want to do is help the planetarium thrive. To not do so makes your stomach ache with needle-like stab—..."
"The Big Boom is a hoaks!" — An anonymous post-show comment card that helps remind me why this field is so important and purposeful. I've been fortunate in being able to enjoy a career that blends many of my passions — writing, astronomy, education, theater, show production... One of the great confluences of my life occurred when my Master's in theater led directly to the position of Astronomer Intern at the renowned Strasenburgh Planetarium in Rochester, NY. 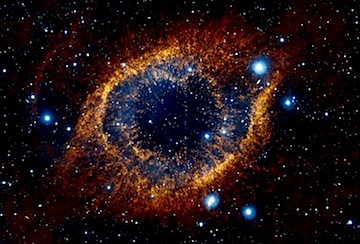 There's an unsung creative medium out there, an active canvas that integrates good science, media, imagination, art, music, theater, narrative — plus the elusive sense of wonder that comes from discovering how way cool the universe really is. That canvas is the planetarium dome. A kissing cousin of documentary and educational filmmaking, and a dynamic platform for science journalism and advocacy, modern planetarium productions go way beyond the simple programs and pointers that were typical years ago when I saw my first "star show." Audiences can now experience a virtual universe created through digital imagery, computer-driven choreography, and production techniques borrowed from movies, television, and theater. The best production teams incorporate modern creative advances in video and sound, computer animation, multimedia, and performance  all with one goal in mind: to bring the universe down to Earth while lifting ourselves up to the stars. The planetarium field, when it does its job right, blends the arts and sciences to the benefit of both. So it's no coincidence that some of my best (and most enjoyable) work as a scriptwriter, educator, and creative director has come while spending time under the big top: the star-filled dome of the planetarium. The Universe & All That Jazz! Visit newly discovered "strange, new worlds" orbiting alien suns ... witness the creation of stars in nature's vast artistic marvels, starbirth nebulae ... and experience a super-black-hole devouring the heart of a galaxy. 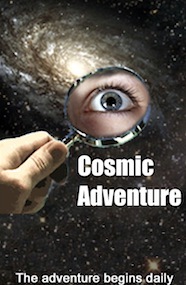 Written for the Boston Museum of Science, Cosmic Adventure presents an eye-popping primer on recent astronomical discoveries — some of the most important in the history of sky-watching. It's a Saganesque travelogue to several remarkable destinations in our Galaxy and beyond. A full-blown multimedia experience, the show makes good use of, among other visuals, sky-filling Hubble Space Telescope imagery of places where the authentic stuff really is stranger and more marvelous than what most people think of as science fiction. 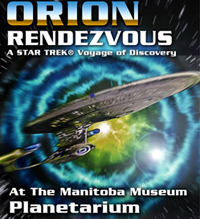 Written and produced in cooperation with (including technical support from) Paramount Pictures, Star Trek: Orion Rendezvous is the only officially sanctioned Star Trek planetarium show. This interstellar odyssey stars LeVar Burton, who portrays his Star Trek: The Next Generation character Geordi LaForge, and Laura Lundy as Capt. Katryana DiChario. Joining LeVar Burton are Jonathan Frakes as Commander Riker and Majel Barrett Roddenberry as the computer voice. Star Trek: Orion Rendezvous takes you on a voyage into both known and unknown territories of space with the crew of the deep-space science vessel Antares. Orion Rendezvous begins after a mysterious wormhole of apparently alien and artificial origin has been appearing and disappearing near Neptune. The audience is a shipload of Starfleet cadets aboard the Antares, which is assigned to follow the wormhole's subway-like path to numerous astonishing — and very real — places in our part of the galaxy. 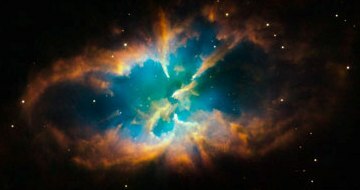 and deep inside the enigmatic Crab Nebula. This "galactic tombstone" is where a gas-enshrouded, radiation-spraying neutron star marks all that remains of a giant sun that blasted itself apart as a supernova thousands of years ago — thus becoming an historically significant celestial beacon on 11th Century Earth (fact) and a touchstone of ancient Vulcan civilization (fiction). Here's where we also get a close look at a derelict alien starship, a millennia-old cosmic mystery that's long been the source of Geordi's favorite ghost stories. At journey's end we rendezvous with the starship Enterprise, the ship that's going to take us to our final Starfleet training destination, and are welcomed to the beginning of our cosmic explorations. OF COURSE using Star Trek to teach astronomy is a good idea. Produced as part of the Star Trek: Federation Science interactive exhibit, Star Trek: Orion Rendezvous has played at science centers across North America, including the Hayden Planetarium of the American Museum of Natural History in New York City (where attendance rose 85%). For me, that's like playing Carnegie Hall. It did well touring Europe too. Because the show was sanctioned and approved by Paramount Pictures, the sound effects were cordially provided by Paramount's Star Trek: The Next Generation and Deep Space Nine studios, and Star Trek's head designer Mike Okuda okayed all of Orion Rendezvous's original 24th-century designs and graphics. However, the Trekkiness isn't what I like best about this show. Orion Rendezvous gave me an ideal opportunity to offer audiences the illusion of being up-close and personal with the dynamic beauty of the universe. The character of the Antares' skipper, Capt. Katryana DiChario, is really me. For her, the universe is far more than cold equations and mathematics — it's also art and architecture and that sense of wonder that comes from seeing what's out there. Thanks to this show, I wrote the only planetarium script that had to be approved by Gene Roddenberry, and met a certain computer graphics artist who is now my wife. 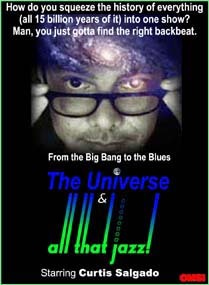 Cosmic evolution from the Big Bang to the blues. Featuring rhythm & blues artist Curtis Salgado, local TV & radio talent Francine Raften, and a funky, jazzy musical score. One of my faves. This upbeat, lively show — inspired by Carl Sagan's Cosmic Calendar — proved you really can demonstrate the known history of the cosmos and the fundamentals of stellar nucleosynthesis with a sense of humor and a jazzy backbeat. Here I wanted a show that zoomed away from the trite planetarium convention of self-important narration and stilted tone. A versatile musical group was hired to create the jazz/funk/blues stereo music track, and a fun part of producing this show emerged in the sound studio when I encouraged Curtis and Francine to improvise, have fun with the script, and "be themselves." They did so in style, with Curtis accompanying himself Memphis-blues-style on his harmonica, and Francine bringing her humor, verve, and broadcast experience to the fore. I knew this show worked when the letters and comment cards came in. A college professor from New York asked if the show could be made available for his Philosophy & Physics class. Another viewer said it was "daring" and should be distributed widely as a video. Yet another simply exclaimed (anonymously, no surprise), "The Big Boom is a hoaks!" -- and that keeps me mindful that the work isn't yet done. A "holographic travel guide" for an interstellar cruise line. 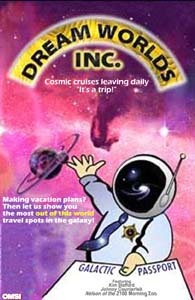 This feature "infomercial" for a cosmic cruise line unfolds as a travel guide for the star-trekking vacationer. Thanks to the casting of professional celebrity impersonators for the "testimonial" parts, this show's narrators include Sylvester Stallone (explaining in comically academic detail the mechanics of supernovas), Marge and Homer Simpson (at Saturn's rings), Robin Leach (extolling the exquisite natural wonders of the Great Nebula in Orion), Kermit the Frog and Miss Piggy (touring a site of new star system formation), John Wayne and Jimmy Stewart (at the Horsehead Nebula), Arnold Schwarzenegger (at the "ultimate Terminator" of a galactic black hole), Yoda, Elvis, and more such playfulness. The original production of Dream Worlds, Inc. contained some stunning full-dome artwork and special effects, including a scene inside Jupiter's upper atmosphere that not only looked as though you could see for thousands of kilometers in all directions, the big fans blowing into the audience helped you feel like it too. The scene where a planet is blasted to slag under our feet by a supernova was an awesome laser-enhanced spectacle. And when we speed into the galactic black hole as a dimensional shortcut back to Earth ... wow! Images and insights from the HST. Originally created for a live presentation I gave at OMSI, a version of this show packed the house at a Worldcon in San Francisco. If you want to see what it was all about, spend some time over at the Hubble Heritage Project. Vacation snaps should be like this. In this futuristic romp, Stella Capella and her fellow students from Asimov Elementary School earn a field trip through the solar system. On the way, they encounter the planets — including a hair-raising dive through a Martian canyon, close flybys of Jupiter's largest moons, passage through Saturn's rings, and a breakneck flight above the shattered surface of Uranus's moon Miranda. Plus, we experience the snarly busdriver Mrs. Kapok, engine failure beyond Pluto, and an endangered starship full of aliens who look like clusters of broccoli. Bold action ensures that First Contact and interstellar amity are established in time for Stella's worldwide birthday bash. This was my first feature-length family show. 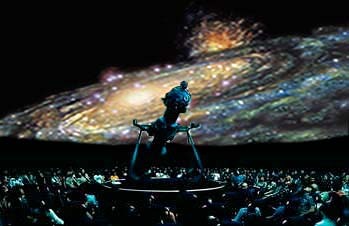 It pioneered what was at the time new approaches to the integration of video within the traditional planetarium format. 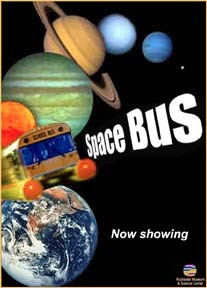 Marketed widely, Space Bus became popular in science centers nationwide. Soon after I left Rochester for Pacific Northwest shores, my former boss received a rather pointed letter from representatives of the Magic Schoolbus series of children's books. Seems the books' author (or someone) saw Space Bus somewhere and noticed its similarities to The Magic Schoolbus Lost in the Solar System. The letter demanded that the show be taken off the market immediately or action would be taken yadda yadda yadda. My ex-boss had to scrounge together all the dated production notes and mail them to the Magic folks to prove that Space Bus did it all first. The Bus continues to fly. Ah, showbiz. Chao-xing (an appropriately concerned student): "Mr. Sternhammer, are we going to die?" Mr. Sternhammer (the ever phlegmatic teacher): "Nah. If we die I have to fill out a form." A tour through Winter deep sky objects, astrophotography, celestial events, and constellation lore. Still one of my favorites, this was one of the most satisfying creative projects I've been involved with. Visually, narratively, musically — it still gives me goosebumps thinking about it. A comic look at the Autumn stars, celestial events, and constellation lore. Both reverent and wacky. I like that combination. A live series about comets and the ways they have touched earthly and human history. 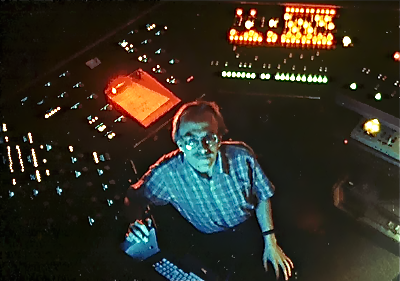 Yours truly at the theater command console, Strasenburgh Planetarium. 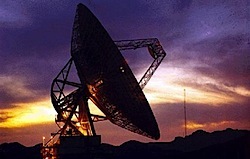 Recent discoveries and insights in astronomy and cosmology. The cosmos beyond our solar system. Stargazing for the young enthusiast. A seminar on the production of planetarium shows. 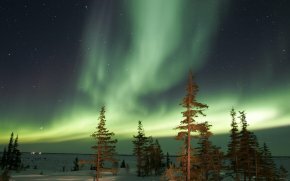 Ethnoastronomy and star lore from many cultures and times. 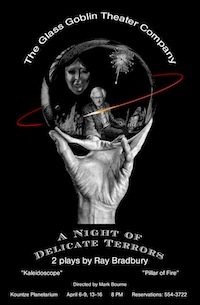 At the Kountze Planetarium (Omaha, NE), I initiated the Theater Under the Dome series, for which I produced and directed the Glass Goblin Theatre Company's A Night of Delicate Terrors: 2 plays by Ray Bradbury. The two plays were "Kaleidoscope" and "Pillar of Fire." This production came to life with a strong repertory cast, unique visuals that placed the actors on Mars, in a futuristic graveyard, and even adrift floating through the deeps of space. Best of all, the show went forward with active cooperation, encouragement, and input from author Ray Bradbury. During the rehearsal phase, he and I exchanged quite a large amount of mail, and spoke on the phone a number of times, with him sending me his thoughts on theater (one of his lifelong passions), as well as articles he'd written and even his own copies of scripts he'd created. My goal was to create a new kind of theater that was (1) entertaining and meaningful to traditional theatergoers, (2) "modern" in a way that attracted and engaged people who never before had set foot in either a playhouse or planetarium, (3) commercially viable (we made money! ), and (4) consistent with Mr. Bradbury's notions and philosophies about an "intimate" theater that provides a physical, elemental experience that's not just three-dimensional TV. We succeeded. Our one regret was that he was unable to join us at the show itself. So afterward I sent him the press notices and a collection of production photos. Some years later I was pleased to hear from Mr. Bradbury that the show's poster was hanging in his dining room. Since then, my story, "Great Works of Western Literature," appeared in an issue of Fantasy & Science Fiction magazine along with Bradbury's "From the Dust Returned" (which he later expanded into a novel). Plus he and I have shared space in a college textbook, one of those fat Norton-style literature anthologies. It's the 4th edition of Literature and Ourselves: a Thematic Introduction for Readers and Writers (New York: Longman, 2003), for courses in second-semester freshman composition and intro to world literature. On my "mostly movies" blog Open the Pod Bay Doors, HAL, I have a post about my time working, sort of, with Bradbury, on the occasion of his 90th birthday in 2010. 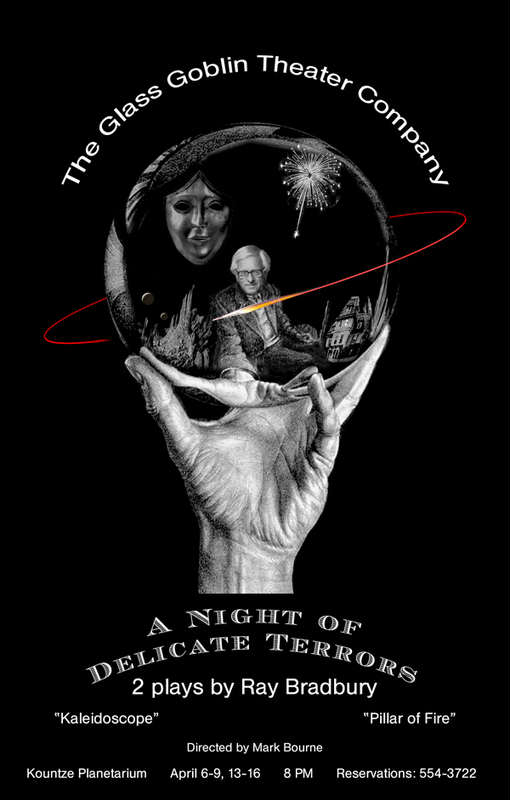 We followed A Night of Delicate Terrors with an entirely different production, Lunacy, a seriocomic satire about the history of women in space exploration. Its narrative follows a woman astronaut on the eve of her spaceflight. Thanks to a reporter dogging her for a scoop, she encounters an elderly but dynamic and wise woman who in the 1960s was one of the thirteen American women pilots that successfully completed preliminary physical and psychological testing to become Mercury astronauts. They believed at least one of their number would eventually go into space, but their testing program was abruptly cancelled in 1962 and they faded from public view. So Lunacy is a play about "the other side of The Right Stuff," a fictional look at the gamut of women astronomers and scientists throughout history, such as Caroline Herschel, Maria Mitchell, and Russia's photogenic cosmonautrix Valentina Tereshkova, the first woman in space. 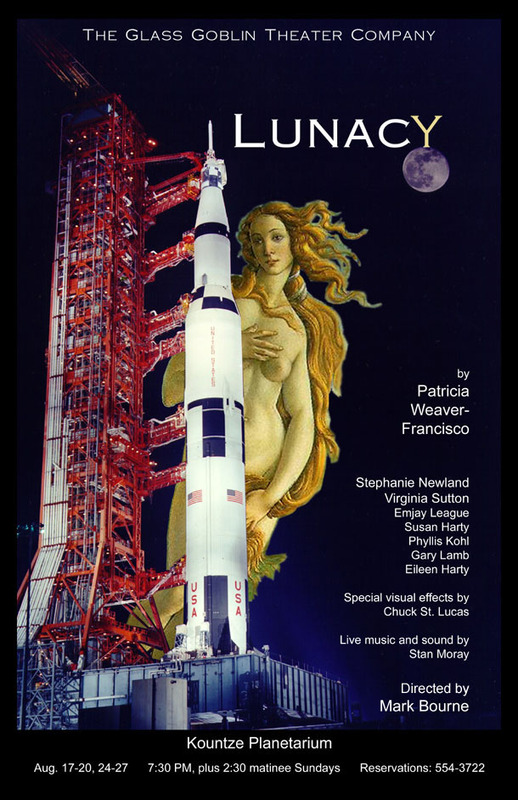 Also staged in the Kountze Planetarium, Lunacy was another creative and commercial success, and another project I'm quite proud of. As media liaison for the Strasenburgh Planetarium, I was science correspondent for Rochester, NY-area television stations. Featured as "guest expert" in news specials during the launch and deployment of the Hubble Space Telescope. Guest expert on Portland-area news programs covering topics such as the Perseid Meteor Shower, solar eclipses, and the repair of the Hubble Space Telescope. Astronomer Intern, Strasenburgh Planetarium, Rochester Museum and Science Center, Rochester, N.Y. Presented live school and public shows at the Kountze, Strasenburgh, and OMSI planetariums. "Of Starshows, Thumbs, and Entropy" published in The Planetarium Primer, Rocky Mountain Planetarium Association. Guest speaker, New York Science Educators Workshop, Rochester Institute of Technology. Guest educator, Science Education Days, St. John Fisher College, Rochester, NY. 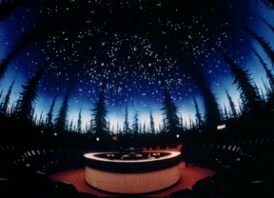 Contributed to the script and production of Return of the Light, a winter solstice program performed live in the OMSI planetarium with Portland's Concord Choir. Produced Psychedelic '60s, a popular laser & multimedia show at the Strasenburgh. Produced Starsongs, a live presentation at the Strasenburgh featuring Michael Lasser, host of the syndicated radio show, Fascinatin' Rhythm. Like its print counterpart, the online brings you all the latest news and discoveries and do-it-yourself tips in astronomy and space sciences. Includes This Week's Sky at a Glance, weekly news updates, expert tips for backyard observers, a comet page, and other goodies. Another excellent resource for amateur skywatchers and armchair explorers, eye-catchingly illustrated. The site also includes helpful guides to scopes and accessories, links to clubs and space places, astronomical software guides, astronomy books, and more. It's probably the best magazine for the general enthusiast. A current day-by-day, night-by-night "sky diary" from the Abrams Planetarium of Michigan State U's Department of Physics and Astronomy. Impress your friends with the ease with which you locate and identify stars, constellations, planets, conjunctions, meteor showers, and other celestial phenomena. You'll wonder how you could have missed all there is to see up there.